My roommate, Kevin recently bought me a Walkman for my birthday and I'm now able to listen to my tape collection on the go again. After a day or two though I started to be annoyed with the headphone cable which restricted my movement and I find a general nuisance to deal with. I decided to try and modify my Walkman to allow me to use my Motorola Buds Bluetooth Headphones (highly recommend by the way). 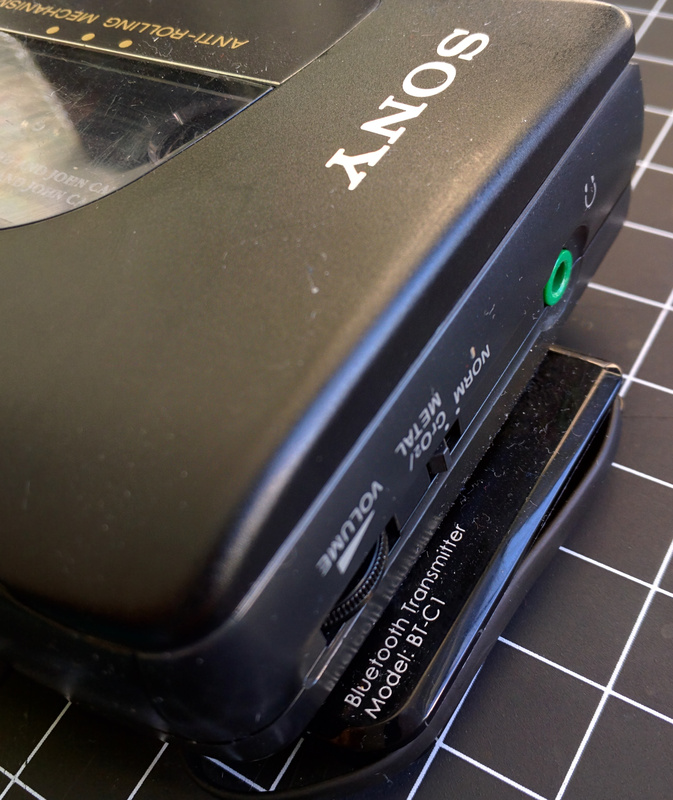 This page is a little guide to how I updated my 1991 Sony Walkman to take advantage of 2015's wireless technology without sacrificing the lovely warmth of tape. You will need a Bluetooth transmitter to send the audio signal from your Walkman. It's important to get a transmitter rather than a receiver as you're sending the sound to the headphones rather than receiving it from another source. Some devices allow both transmitting and receiving, though I'd stick with a dedicated transmitter. 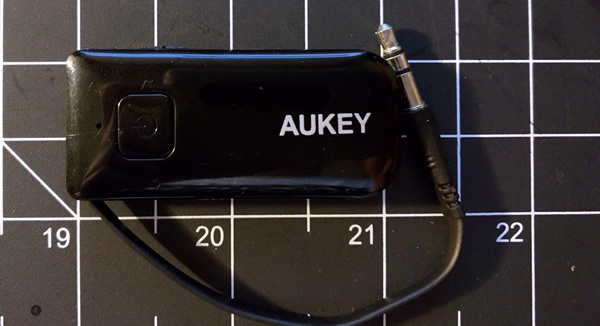 I choose this Aukey one as it had decent reviews, I knew of the brand and it promised a high quality signal with low latency. I reckon most of the others (at least in the same price range) are comparable to it in terms of quality so go what suites you best. The shape is also important. I would have liked one without a cord (i.e. just a 3.5mm jack coming out of the unit) but this worked too as its depth was equivalent to the belt clip so I glued it to the back. 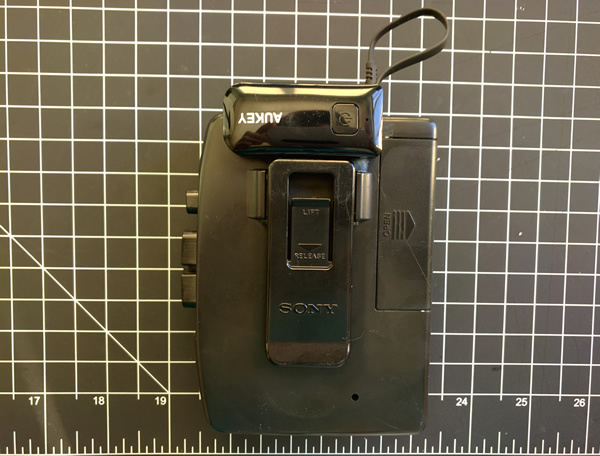 Please note: Obvious as it sounds, if you're gluing the transmitter to the Walkman with super-glue it will probably leave a permanent scar on the body of both devices. All that's left to do now is sync the transmitter with the receiver (i.e. your Bluetooth headphones). This operation will differ slightly depending on the specific transmitter. With mine it's a simple as turning on the headphones and holding down the button on the transmitter for 5 seconds. Now press play and... voilà ! Stereo audio streamed from your Walkman to your headphones with the same beautiful sound but without the tangle of cords! One of the things I like about this transmitter is I can tuck the jack into the body when not in use or I want to use a different output source. You can transmit the audio of your Walkman to most modern Bluetooth receivers so it could also be speakers say. You can use the transmitter in any 3.5mm headphone/output socket (or 1/4" with an adapter). I used this adapter with my tape deck, Discman and TV before gluing it to the Walkman.. It could be good if you want to move about late at night in a room but don't want to disturb others with the music.